Fort Jefferson (2) (1791-1796) - First established in October 1791 by General Arthur St. Clair just before his disastrous defeat by Miami Indian Chief Little Turtle. Named after then Secretary of State, Thomas Jefferson. Abandoned in 1796. Built during the Northwest Territory Indian War (1785–1795) as a 114' square palisaded fort with bastions at each of the four corners. Two blockhouses were added in 1792. The fort was built just one month before General Arthur St. Clair suffered a major defeat that cost some 900 Americans killed out of a force of about 1200. 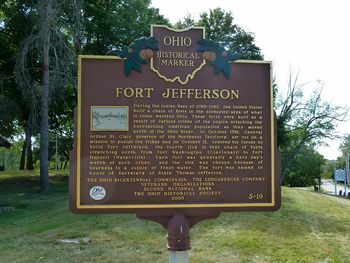 The remnants of St. Clair's command retreated back to Fort Jefferson and then back to Fort Washington (4). The disaster caused General Washington to force General St. Clair's resignation and he placed General "Mad" Anthony Wayne in charge of an elite force to finish the war. Part of Fort Jefferson State Park. 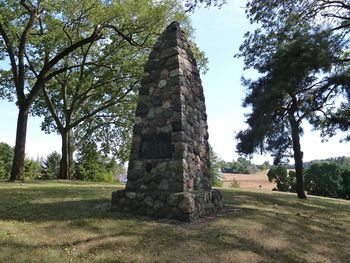 The most prominent feature is a large stone monument placed at the top of the hill by the Greenville Historical Society in 1907. Markers are placed at the locations of significant archeological findings that include the blockhouse, trenches, the well and a fire pit. This page was last modified 19:52, 24 March 2019 by John Stanton. Based on work by Bill Thayer.